EmpowerMoments is excited to celebrate with one of our faithful subscribers, Ms. Latosha Brown. Latosha has been nominated as a “Champion of Change” by the White House for her work to help the Gulf Coast recover from the BP drilling disaster. The Gulf Coast Fund is a community-led philanthropy working towards a just and sustainable Gulf Coast region that funds and supports over 200 grassroots organizations. They have given out over $4,000,000 to date in grants. “Champions of Change” is a special series at the White House that profiles Americans from across the country who are doing extraordinary things in their communities to out-innovate, out-educate and out-build the rest of the world. 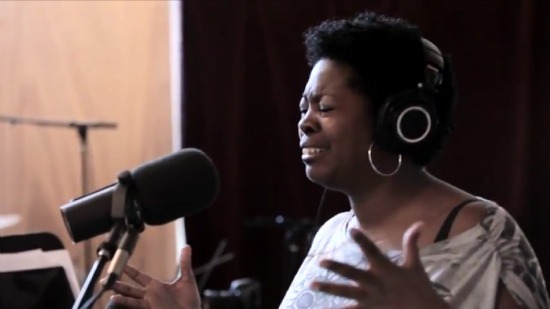 As if going to the White House to be nationally recognized for her work wasn’t enough, she has now become a YouTube sensation for her soulful rendition of “I Know I’ve Been Changed.” The impromptu video was shot during a break as a warm-up while preparing to sing backup vocals for Mark Growden’s album. When YouTube featured the video (out of millions of videos) on their Music Tuesday’s homepage, it only had 200 views. In only 3 days that number has grown to over 580,000 views. According to YouTube their average views for a Music Tuesday feature is about 70,000. Go Tosha! Go! Click on the link at the end of the post to view the video. Empowermoments is excited that Latosha has allowed her gifts of helping people through philanthropy and the gift of song to make room for her. Personally, I have known Latosha since I was a teenager. She was my mentor, big sister and friend who helped guide this once wayward teen. Please show her some love and celebrate with her EM subscribers. Pray that God orders her steps and gives her keen discernment as new opportunities open up in her life. Have a great weekend! You can view the video by clicking here or copying and pasting the link into your browser http://www.youtube.com/watch?v=0ST66D3qpPU. Next postI Was Made For This! Congratulations, Latosha and to God be the glory! Beautiful voice, as well! Congratulations Latosha!!!! Ur truly blessed- a beautiful voice and the will to empower others!!!! God is all over u and it looks wonderful girl!! Thank you to the sisters of EmpowerMoments! God is teaching me everyday that He can change your circumstances in the blink of an eye. I am so in awe of how God works to push us towards our destiny in spite of our limitations. I appreciate the love, y’all! Congratulations! God is doing some amazing things in your life. You are a true example of your gift making room for you!